With Fire-Rated MV1000 Media Chest Get Peace of Mind. 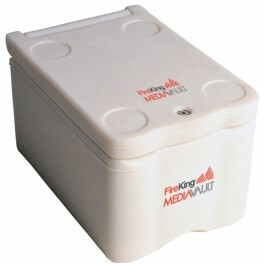 The Media vault is a compact stand-alone storage safe that is engineered to protect data and media. The MV1000 protects photographs, computer media, microfiche and any of the other media listed below. Your contents will be safe from dust and fires up to 1700F. The Underwriters Laboratory (UL) has given the MediaVault a Class 125 one hour rating. This means the interior temperature of the MediaVault will stay below 125 degrees F when outside temperatures are below 1700 F for one our or less. This is the only small media safe that meets this criteria. 5 7/8"H x 6 1/4"W x 8 7/8"
See our FAQ or contact us if you have questions.